We’d love your help. 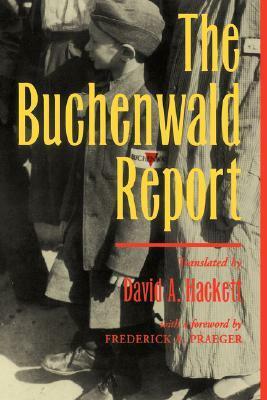 Let us know what’s wrong with this preview of The Buchenwald Report by David A. Hackett. To ask other readers questions about The Buchenwald Report, please sign up. Do any of the interviews mention Josephine Baker's performance at Buchenwald? A seemingly endless saga of sadistic brutality and unrelenting horror, this was a tough one to get through. I can't say I enjoyed this book but, for the fullest picture of the inner workings of a Nazi concentration camp, I don't think it could be beat, considering the circumstances under which it was written. Buchenwald was not an extermination camp in the sense that Auschwitz was, although tens of thousands were murdered, starved, worked to death or driven to suicide there. The majority of inma A seemingly endless saga of sadistic brutality and unrelenting horror, this was a tough one to get through. Buchenwald was not an extermination camp in the sense that Auschwitz was, although tens of thousands were murdered, starved, worked to death or driven to suicide there. The majority of inmates at this camp were not Jews; they were primarily political prisoners (antifascists), criminals, "antisocials," Gypsies, homosexuals, non-Jewish Poles and Russian prisoners of war. The spirit and ingenuity of the inmates that emerged under such horrific conditions were awe-inspiring, from the myriad deceptions used to save lives to the subtle methods of sabotage that cut production at the armament works in the camp to almost nil. My dad was part of the GI advance team that liberated the camp. Hackett is amazing. As a former UTEP graduate student of his, I can vouch for his incredible teaching methods and the soundness of his research. Luckily for the readers, these traits are both carried over into this text. My only regret is that I could not take more courses from him. Great summary of camp life: not for general consumption. Many personal statements and observations by prisoners of all countries. May be somewhat biased by politics of East German author, but it gives a great anti-fascist view.